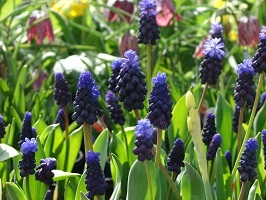 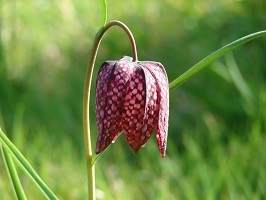 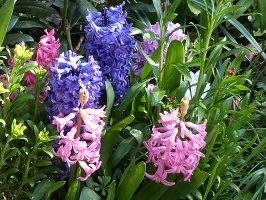 In spring we have a variety of bulbs to buy potted up for instant pleasure in your borders, from a colourful selection of tulips and Narcissus (daffodils) - including dwarf varieties - to Alliums, Crocus, English Bluebells, Fritallaria (fritillary, including snake’s head), Hyacinth, Muscari (grape hyacinth), Scilla and more. 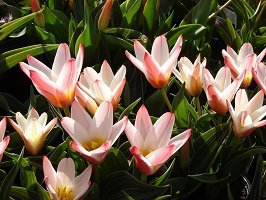 Most bulbs should be planted with their bases at a depth roughly equivalent to twice their circumference, although it can be beneficial to plant a little deeper on light soil to prevent drying out. 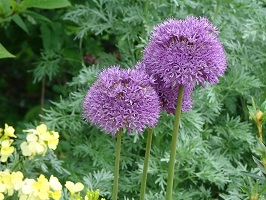 Alliums (of the onion family) are one of the best bulbs for dry conditions and are considered drought tolerant. 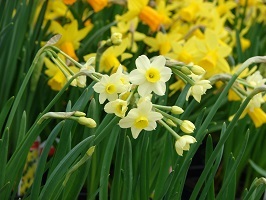 Most bulbs will be grateful for a scattering of bonemeal when planted and in springtime, and can be lifted and divided every few years to make new clumps. 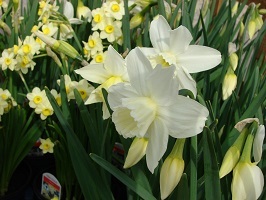 This list is by no means exhaustive – to see our full range you will have to come and visit us! 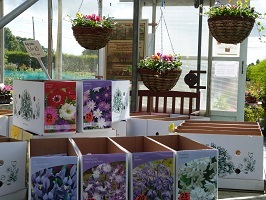 Please also bear in mind that not all plants will be in stock at any one time –if there is a variety you particularly want, please phone or email to check beforehand.